Colin Napier continues to chart the footprints of French Huguenots. Henry IV, the first Bourbon King, had been a Huguenot converting to Catholicism on his ascendency to the throne. As a sort of thank you to his Huguenot supporters he had declared the Edict of Nantes in 1598. Amongst a swathe of rights this had given the Huguenots freedom of worship within France. Over the next hundred years the edict had remained in place although most of the privileges afforded the Huguenots were gradually eroded, notably by Cardinal Richelieu when he wasn’t being thwarted by pesky musketeers. As time passed there was a gradual migration of Huguenots from France to Protestant lands particularly the Dutch Republic and England. Louis XIV (him of the sunny disposition) initially pursued a policy of strict adherence to what remained of the Edict of Nantes coupled to a blind eye to ill treatment, most infamously the billeting of the more uncouth sort of Dragon with Protestant families. In 1685 this culminated in the revocation the Edict of Nantes which led to a period of forced conversions and persecution. It is hard to underestimate the impact this had on French society even as recently as 1985 Francois Mitterand issued an apology for the revocation. 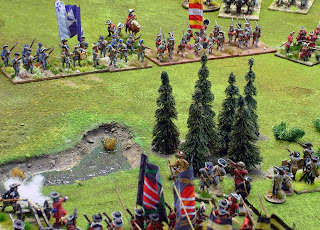 The Huguenot Brigade approaches 'Bloody Hollow' at Aughrim. There was even a stamp. Protestant nations, naturally took a dim view of this development in France and made a show of support for Huguenot refugees. In the Dutch Republic although many of the more bellicose Huguenots had found their way into Dutch service over the decades (when not fighting for or against the French crown or indeed with each other) it was now that the Stadt Holder William III of Orange began actively appointing Huguenots to senior positions in the Dutch Army. 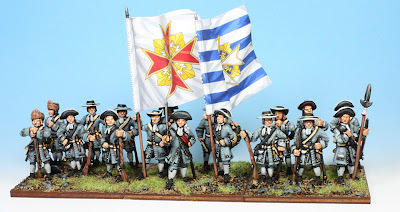 As it turned out over the years 1685-89 he had plenty to choose from as within France the Huguenots had been well represented in the armed forces. By the time Schomberg (another with big Huguenot connections) landed his army in Ireland some historians estimate that Huguenots made up some 10% of the officer corps. An example was du Cambon an engineer in the French Army when he moved to the Dutch Army in 1689 he found himself promoted first to head of engineers and then to the rank of Major General in 1689. 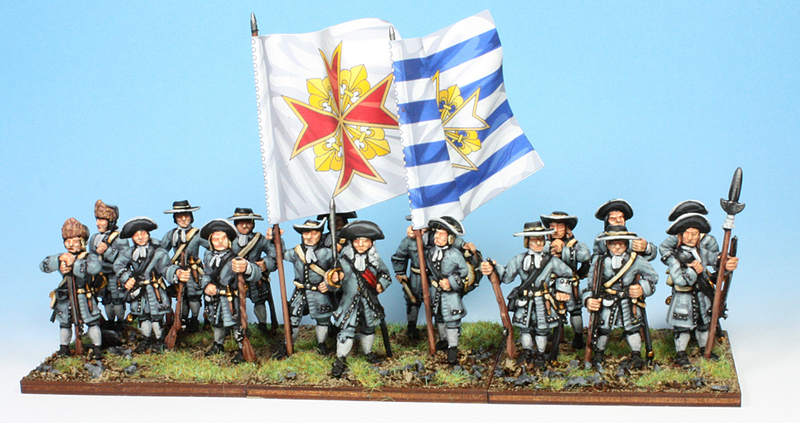 Of course du Cambon was to be the colonel of one of the Huguenot regiments formed in that year and it’s these I’ll look at next.